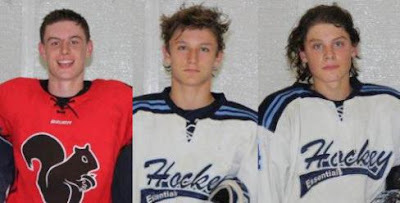 The Terrier Hockey Fan Blog: Terrier PA announcer Prior passes; "dynamic scoring forward" commits for 2020--UPDATED. Terrier PA announcer Prior passes; "dynamic scoring forward" commits for 2020--UPDATED. A favorite of Terrier fans and players (see Twitter links below), Prior was inducted into the Massachusetts Hockey Hall of Fame in 2013. A 20-year veteran of the U.S. Navy, who served in Vietnam, Prior also was active in Eastern Junior Hockey. 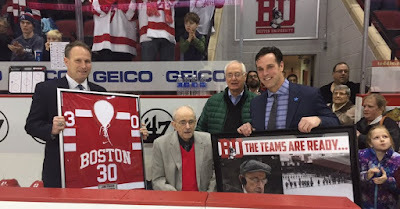 Last season, during the Jan. 29 game against Merrimack, BU recognized Prior for his 30 seasons behind the mic at Walter Brown Arena and then at Agganis Arena. 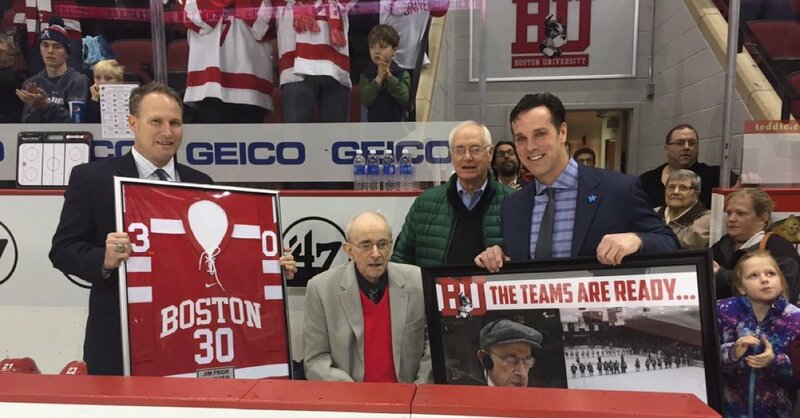 He also was honored in 2013 during the Hockey East semifinals, on the night when BU beat BC for Jack Parker’s final win as BU coach. PrioritySelection.com also tweeted “Zegras still needs to fill out and add strength, but his skill-set is firmly that of 1st round calibre by 2017 #OHLDraft standards.” Priority Selections currently ranks McCarthy at #3 and Mastrosimone at #6 for the 2017 OHL Draft. 01 F Trevor Zegras (BU) is a confident skater with terrific hands & no panic in his game. He manufactures offense w/ speed & elusive shifts. The 5'10" speedster with high end skills was named all-tournament at this past weekend’s Junior Chowder Cup event, along with 2019 recruit Mastrosimone. 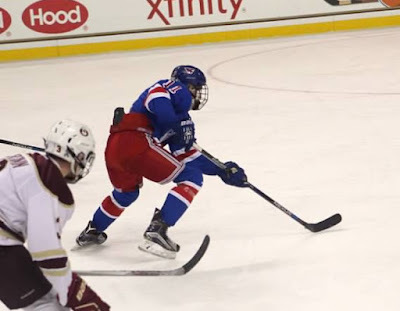 Zegras and Mastrosimone each scored a goal for Hockey Essentials White in the ’01 Division championship game, a 3-2 OT loss to Black Squirrel, coached by former BU captain Carl Corazzini. Zegras had a 3-2-5 scoring line in three ’01 Division games. Zegras and Mastrosimone did double duty, also skating for ’00 Division champion Hockey Essentials Black, scoring a goal and an assist. Mastrosimone scored a pair of goals, including the game-winner, in the ’00 title game. In ’01 Division games, he tallied four goals and five assists. In the recent USA Hockey Select 15 Development Camp, Zegras scored a pair of goals in three games. A Bedford, N.Y. native, Zegras starred for the Mid-Fairfield Rangers, leading the 14U team to the Tier 1 Youth Nationals (won by Shattuck St. Mary’s with Mastrosimone and Doyle). He skated on the Jr. Rangers’ top line, racking up 65 goals and 57 assists in 66 games and six points in three games at Nationals. Next season, Zegras will play for Avon Old Farms, helping to fill the void left by 2016 BU recruit Patrick Harper. An incisive, offensively-gifted firebomb who is smaller than many defensemen and comes at the net every which way, almost always with the puck in hand. Highly engaged, great speed and quickness, bursts to separate and is very skilled. Passes the puck with glowing threads when he feels like sharing. Good shot selection on the whole even with a high volume of efforts, creates high quality chances for himself. Shoots left. 3. Trevor Zegras, LC, #11 Mid-Fairfield Jr. Rangers U14 – Terrific hands and playmaking ability. Smooth on his skates. Agile. Lightning quick. Terrific hand-eye coordination. Scored nice backhand goal vs. the Marlies on Saturday afternoon while slashing to the net. Scored another when he curled out from behind the net and roofed one. Also had an assist, thus figuring in all three goals while leading his eam to 3-1 win. Quite a performance.